Cell biologists research the intricate relationship between structure and function at the molecular, subcellular, and cellular levels. However, a complex biological system such as a biochemical pathway can only be understood after each one of its components has been analyzed separately. Only if a biomolecule or cellular component is pure and biologically still active can it be characterized and its biological functions elucidated. Fractionation procedures purify proteins and other cell constituents. In a series of independent steps, the various properties of the protein of interest—solubility, charge, size, polarity, and specific binding affinity —are utilized to fractionate it, or separate it progressively from other substances. Three key analytical and purification methods are chromatography, electrophoresis, and ultracentrifugation. Each one relies on certain physicochemical properties of biomolecules. Chromatography is the separation of sample components based on differential affinity for a mobile versus a stationary phase. The mobile phase is a liquid or a gas that flows over or through the stationary phase, which consists of spherical particles packed into a column. When a mixture of proteins is introduced into the mobile phase and allowed to migrate through the column, separation occurs because proteins that have a greater attraction for the solid phase migrate more slowly than do proteins that are more attracted to the mobile phase. 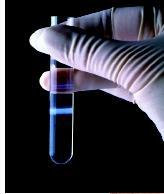 Test tube showing the opalescent line of purified adenovirus after centrifugation. ferences in physicochemical properties between different proteins. It takes advantage of the ability of proteins to bind specific molecules tightly but noncovalently and depends on some knowledge of a particular protein's properties in the design of the affinity column. Many important biological molecules such as proteins, deoxyribonucleic acid (DNA), and ribonucleic acid (RNA) exist in solution as cations (+) or anions (-). Under the influence of an electric field, these molecules migrate at a rate that depends on their net charge, size and shape, the field strength, and the nature of the medium in which the molecules are moving. Electrophoresis in biology uses porous gels as the media. The sample mixture is loaded into a gel, the electric field is applied, and the molecules migrate through the gel matrix . Thus, separation is based on both the molecular sieve effect and on the electrophoretic mobility of the molecules. This method determines the size of biomolecules. It is used to separate proteins, and especially to separate DNA for identification, sequencing, or further manipulation. Cells, organelles , or macromolecules in solution exposed to a centrifugal force will separate because they differ in mass, shape, or a combination of those factors. The instrument used for this process is a centrifuge. An ultracentrifuge generates centrifugal forces of 600,000 g and more. (G is the force of gravity on Earth.) It is an indispensable tool for the isolation of proteins, DNA, and subcellular particles. Alexander, Renee R., and Joan M. Griffiths. Basic Biochemical Methods, 2nd ed. New York: Wiley-Liss, 1993. Bollag, Daniel M., and Stuart J. Edelstein. Protein Methods. New York: Wiley-Liss, 1991. Scopes, Robert K. Protein Purification: Principles and Practice, 3rd ed. New York: Springer Verlag, 1994.